It’s no secret that we at The Amazing Blog LOVE food. We are always trying new restaurants and recipes, and searching for new dishes to fall in love with. 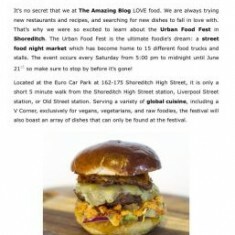 That’s why we were so excited to learn about the Urban Food Fest in Shoreditch. The Urban Food Fest is the ultimate foodie’s dream: a street food night market which has become home to 15 different food trucks and stalls. The event occurs every Saturday from 5:00 pm to midnight so make sure to stop by before it’s gone! Located at the Euro Car Park at 162-175 Shoreditch High Street, it is only a short 5 minute walk from the Shoreditch High Street station, Liverpool Street station, or Old Street station. Serving a variety of global cuisine, including a V Corner, exclusively for vegans, vegetarians, and raw foodies, the festival will also boast an array of dishes that can only be found at the festival. While the Urban Food Fest is sure to make your taste buds happy, there will be plenty of other things to do whilst you chow down. Listen to great live music by up and coming bands, singers, and DJs as you observe the modern art and contemporary photography that is displayed. World famous make-up artist Kat Kraft will also be offering her talented services in the form of fun face paints, bringing us straight back to our childhood theme park outings. 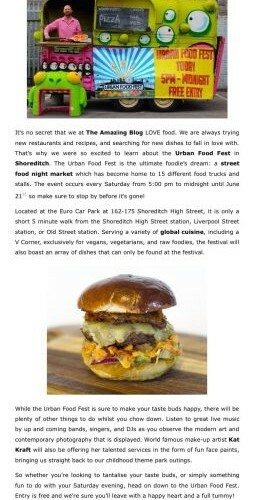 So whether you’re looking to tantalise your taste buds, or simply something fun to do with your Saturday evening, head on down to the Urban Food Fest. Entry is free and we’re sure you’ll leave with a happy heart and a full tummy.